A pinhole camera , or camera obscura  (meaning "dark room" in Latin), is the most basic type of camera. It is simply a closed box or room with a tiny hole on one side (see Figure 2). Pinhole cameras are fun to build, and we show you how to build one here. In Figure 2, rays of light from points on the tree pass through the pinhole and strike the opposite side of the box. This forms an image of the tree inside the box. This image looks exactly the way your eye would capture it, only it is upside-down . 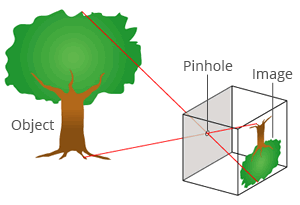 The size of the tree in the image depends on the tree's distance from the pinhole − the farther the object is, the smaller its image will be. 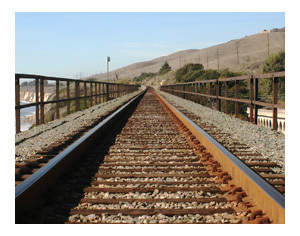 For example, even though the width of the railway track in Figure 3 is the same along its entire length, the track appears to get narrower with distance from the camera. This effect is called perspective distortion. We experience this distortion as well. In fact, it is useful as it helps us gauge how far objects are from us. Pinhole cameras present an interesting dilemma. To form a sharp image, the pinhole must be tiny. However, the smaller the pinhole gets, the less light it passes through and the darker the image gets. Indeed, it is not possible for a pinhole camera to capture an image that is both bright and sharp. The lens, however, is designed to do exactly that. Adapted from "Pinhole-Camera," May 24, 2008. [Online image]. Available: http://en.wikipedia.org/wiki/File:Pinhole-camera.svg. DeiselDemon, "Vanishing Tracks," Nov 13, 2008. [Online image]. Available: http://www.flickr.com/photos/28096801@N05/3028190536. "Pinhole Camera," Wikipedia, The Free Encyclopedia. Oct 2, 2009. [Online]. Available: http://en.wikipedia.org/wiki/Pinhole_camera. "Camera obscura," Wikipedia, The Free Encyclopedia. Oct 2, 2009. [Online]. Available: http://en.wikipedia.org/wiki/Camera_obscura. [Accessed: Oct 4, 2009]. "How To Make A Pinhole Camera," http://www.instructables.com/, Jan 14, 2009. [Online]. Available: http://www.instructables.com/id/How_To_Make_A_Pinhole_Camera. "Perspective (visual)," Wikipedia, The Free Encyclopedia. Oct 2, 2009. [Online]. Available: http://en.wikipedia.org/wiki/Perspective_(visual).